Premier League Primary Stars | Thousands of pupils across the country are Writing Stars! Thousands of pupils across the country are Writing Stars! In our recent Premier League Writing Stars competition over 750 schools took part, submitting over 25,000 poems! Pupils aged 5-11 across England and Wales immersed themselves in the world of poetry to write their own poems on the theme of resilience, giving them and their school a chance to win amazing prizes. These include a school visit by a children's author or poet to lead a poetry workshop, plus the Premier League Trophy; the winning poems read aloud by a Premier League star and captured on film; an invitation to an exclusive award ceremony; and the chance to have the winning poems published in a book, among other prizes. Using our online curriculum-linked resources, pupils were encouraged to draw influence from a time that they had to Try, Try Again. This was also the theme of our TV campaign that featured a host of familiar faces. You can watch our TV advert here. The competition has now closed and poems are in the process of being read by our all-star judging panel including Children's Laureate and writer of the Charlie and Lola books Lauren Child, former footballer and now children's author Frank Lampard, Everton star Yannick Bolasie and the Young People's Laureate for London, Caleb Femi. Head judge will be Jonathan Douglas from the National Literacy Trust. Winning schools will be contacted in February 2018 ahead of the award ceremony in March 2018. The story of one lucky school who received a visit from the Premier League Trophy! Premier League Writing Stars winners announced! We are delighted to announce the winners of this year's poetry competition centred on the theme of Diversity. 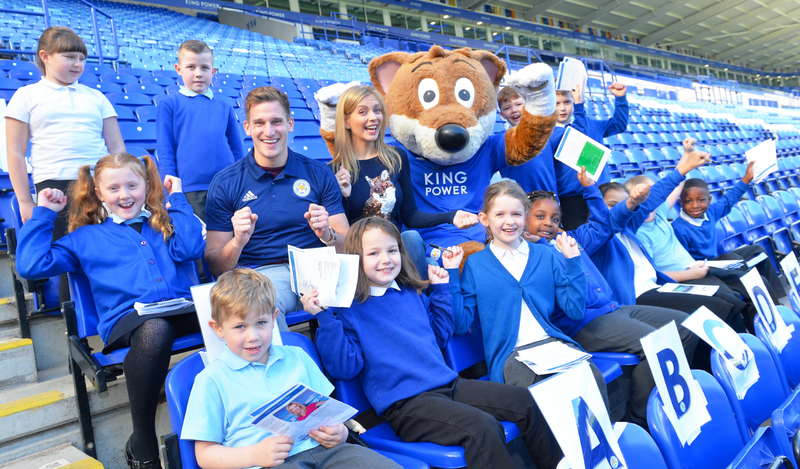 The star joined pupils at King Power Stadium for Maths fun.